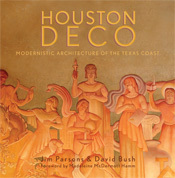 Houston Deco was published with generous support from the Houston Architecture Foundation and the Strake Foundation. Modernistic architecture, which encompasses Art Deco and Art Moderne design, flourished between the end of World War I and the beginning of World War II. Although the style arrived in Houston comparatively late in the 1920s, it came at a critical time in the city's development, when Houston was beginning the transition from medium-sized Southern city to major American metropolis. Prior to 1927, most architect-designed buildings in Houston were either local versions of classical revival architecture or Victorian designs adapted for the city's hot, humid climate. Modernistic architecture's growing popularity coincided with a conscious effort by Houston’s business and civic leaders to tie the city’s image to the American West and de-emphasize its Southern heritage. For many Houstonians, modernistic buildings represented the city’s future. The changes brought about by the arrival of modernistic architecture are clearly illustrated by the two tallest buildings constructed in Houston in the 1920s. The Niels Esperson Building (1927, right) is covered with detailing inspired by classical architecture, while the Gulf Building (1929, far right) is comparatively austere. Despite these differences, modernistic buildings did not completely break with the past. The Gulf Building is influenced by Gothic design, and many of the city's Art Deco buildings exhibit stylized versions of classical architectural details. Modernistic buildings are not concentrated in any one neighborhood in Houston, but can be found throughout the areas of the city developed before 1950. The vast majority of modernistic structures in Houston are commercial, industrial or apartment buildings. Several major Depression-era government projects, some private residences and at least three houses of worship were also designed in the modernistic style. Preservation Houston has assembled this information to increase public awareness and appreciation of the city's surviving modernistic architecture, focus attention on endangered buildings and provide a record of those that have been lost. This Web site provides a detailed sampling of the rich variety of Houston's Art Deco and Art Moderne architecture. 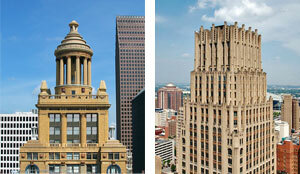 Most Modernistic buildings in Houston exhibit elements of both Art Deco and Art Moderne design. There are very few textbook examples of either Art Deco or Art Moderne architecture in the city. The classic angular design of the 1920s is sometimes called Zigzag Moderne. The style is most frequently seen on commercial and government buildings. Skyscrapers of the period frequently exhibit Art Deco ornamentation. Weingarten's Food Market No. 11 (1930) • Stucco was used to create smooth wall surfaces, although brick was also common in Houston, especially on apartment and commercial buildings. Cordova Shell limestone was frequently used to surface major government buildings in Texas. • The façade was usually symmetrical. • Angular geometric forms such as zigzags and chevrons were used as decorative elements. Stylized sculpture and bas relief panels were frequently used on major public buildings. • Pylons, towers and other projections above the roofline gave Art Deco buildings their vertical orientation. Metals such as aluminum and nickel were used to create elaborate grilles, plaques and other decorative elements. Metal ornamentation marking entryways was particularly ornate. Influenced by the sweeping lines of 1930s industrial design, Art Moderne reflects the era's fascination with streamlined ocean liners, locomotives and airplanes. As a result, the style is often called Streamline Moderne. Most Art Moderne buildings are commercial and industrial structures, although the style's impact can be seen in the design of a few private homes. River Oaks Community Center expansion (1948) • Art Moderne buildings usually had flat roofs and smooth wall surfaces covered with stucco. • The façade was usually asymmetrical. • Small ledges at the roofline and horizontal grooves or lines in the walls accentuated the horizontal orientation of Art Moderne buildings. • One or more corners of the building were rounded. • Windows were often continuous around corners. Glass block was used frequently and sometimes covered whole sections of wall. Small round windows were also common. • Stainless steel was used to create streamlined banisters, signage and decorative elements. Alfred C. Finn and Joseph Finger, the most prominent and prolific Houston architects of the period, were each responsible for several significant modernistic buildings. Finn created restrained Art Deco designs for banker/developer/publisher Jesse H. Jones. Finger designed more exuberant buildings for a variety of private clients. Other important Houston architects of the period include Kenneth Franzheim, whose work on the Gulf Building helped bring modernistic architecture to prominence in Houston. Wyatt C. Hedrick designed a variety of distinctive buildings throughout the period, though most of his major works in Houston have been altered or demolished. Moore & Lloyd created refined interpretations of Art Moderne design for commercial clients. Lamar Q. Cato specialized almost exclusively in school buildings. Even John F. Staub, who established his reputation designing elegant homes in a variety of revival styles, and William Ward Watkin, best known for his neo-Gothic churches and school buildings, tried their hands at modernistic design. Dallas architect W. Scott Dunne gave southeast Texas some of its most distinctive neighborhood movie theaters. In Galveston, Ben Milam designed straightforward modernistic buildings for a variety of commercial and institutional clients. Ninety miles east of Houston, talented Beaumont architects Fred C. Stone and Augustin Babin created a unique collection of classic Art Deco buildings that are among the most significant modernistic designs in Texas. Although several of the buildings pictured are clearly endangered through willful neglect, the threats to other historic properties are not so obvious. While it is illegal to demolish buildings designated as City of Houston Protected Landmarks, buildings with the more common City of Houston Historic Landmark designation and those listed on the National Register of Historic Places may still be torn down. In Houston’s atmosphere of here-today, gone-tomorrow development, even productive, well-maintained buildings are endangered. In 2007 alone, the Coca-Cola Bottling Plant (1929), H0uck house (1947) and a section of the River Oaks Shopping Center (1937) were demolished. The River Oaks Theater (1939) and Alabama Theater (1939) will likely face the wrecking ball in the near future. In Houston, almost all historic architecture is endangered architecture. Preservation Houston is funded in part by grants from the City of Houston through the Houston Arts Alliance.